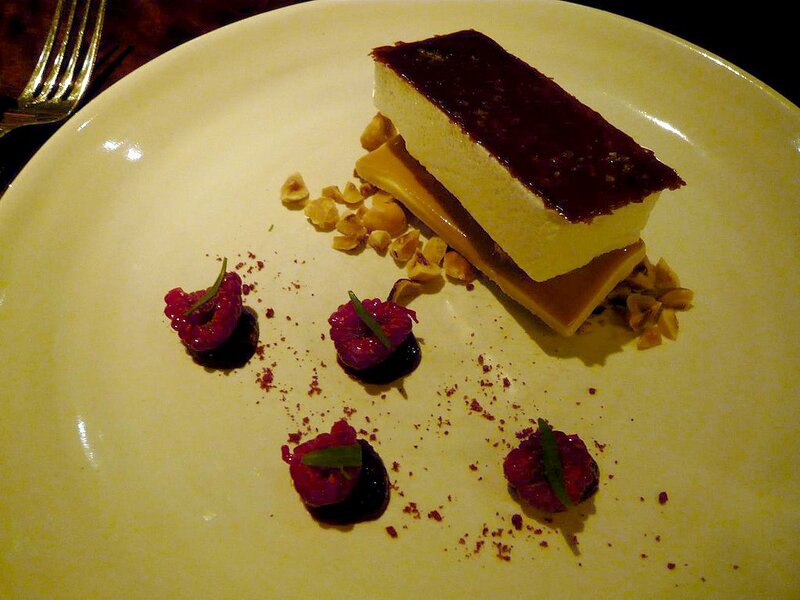 A while back I dined at the bar at Coi when I was in SF. 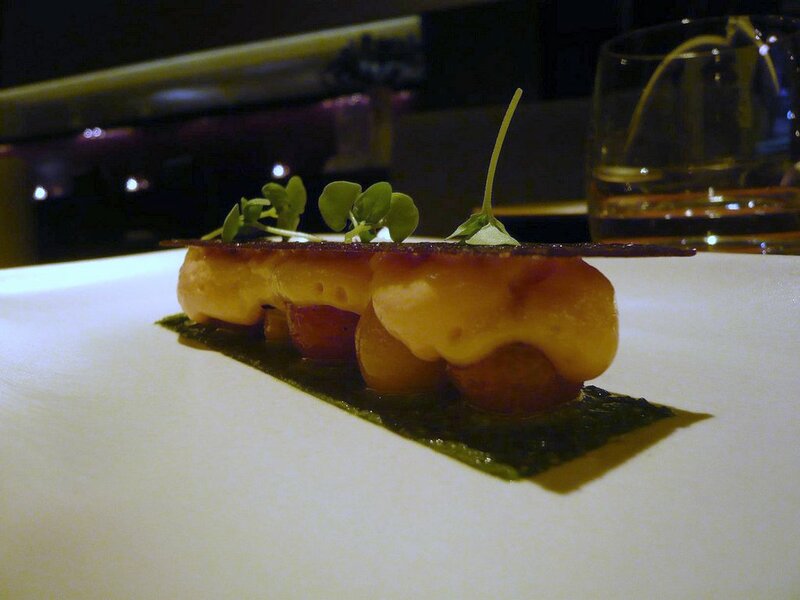 The two-star Michelin restaurant came recommended by KevinEats. Reserving a table in the dining room restricts you to the tasting menu while dining at the bar you can do either tasting or a la carte. Not knowing what my companion would want, I reserved a table at the bar, but we ended up going with the tasting menu after all. Both the bar and the dining room areas are small, so do make a reservation if you plan to go. 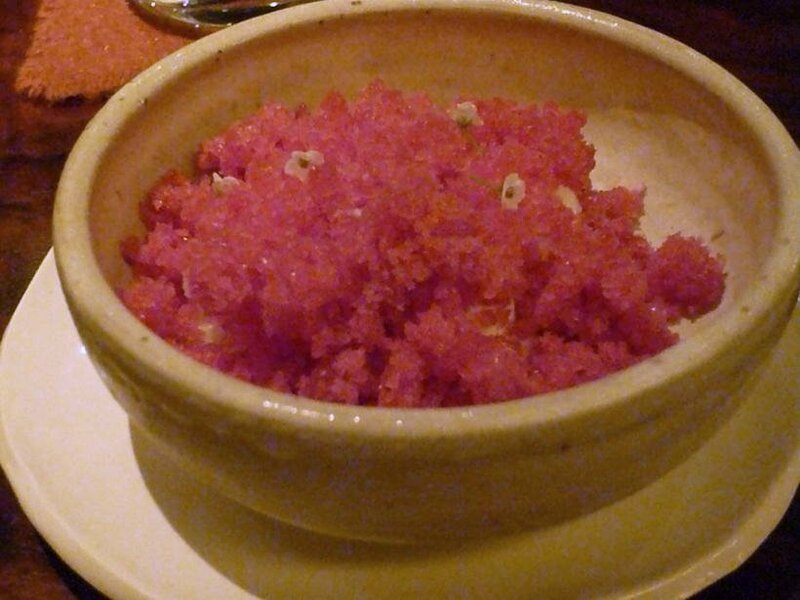 With a slight saltiness, it was less sweet than your typical palate cleanser. These were again slightly salty, unexpectedly so upon hearing "melon and cucumber". For me the saltiness took away from both fruits' refreshing quality. The meal took a major turn for the better for my tastes as we moved to the savory dishes. 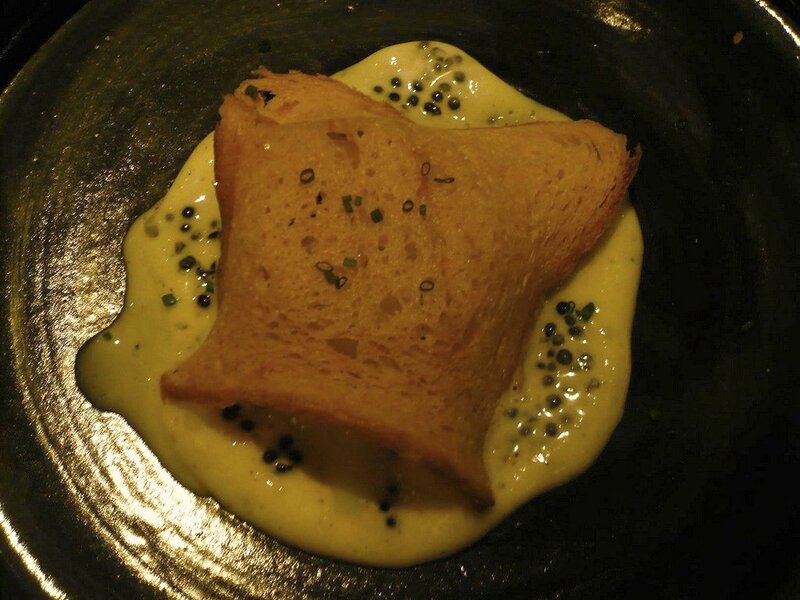 #3: California Caviar, farm egg, creme fraiche, brioche, chive. Chicken egg+fish egg=win. Having mixed the runny egg with the creme fraiche, I simply could not resits cleaning the plate completely using my crisp, toasted brioche. Yet another great dish. The beautiful fresh cherry tomatoes are sandwiched between the black olive "crackers". A winner both in flavor and texture combination. 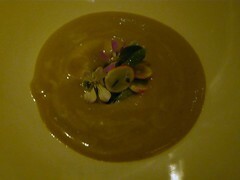 This was a very well prepared soup albeit it is overshadowed by the other great dishes that night. 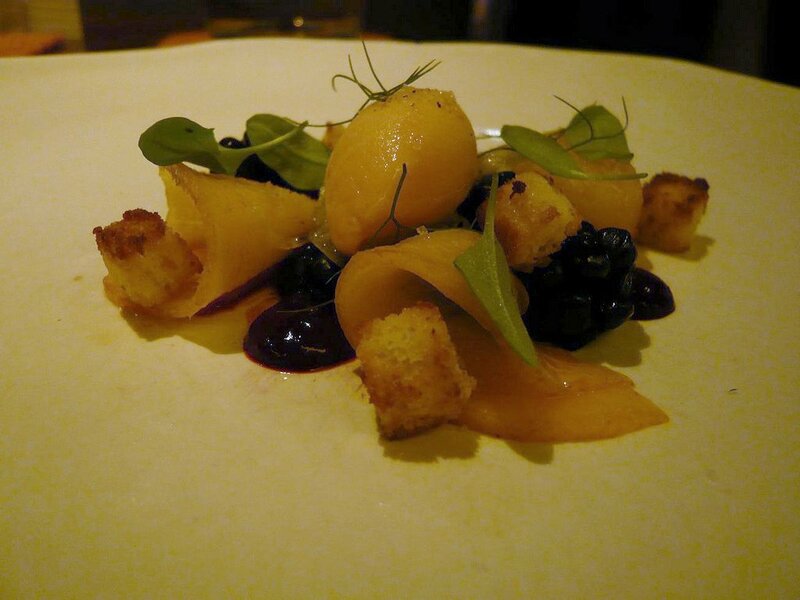 This was an excellent savory dish, and probably one of the best dish I've had in SF to date. The fresh and chewy abalone had a hint of smokiness. 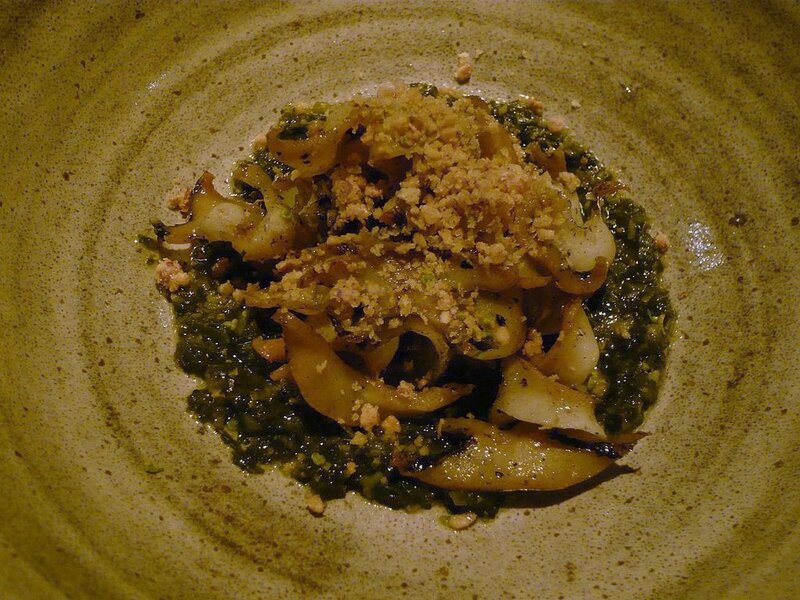 And the nettle dandelion salsa verde? Uncannily good. 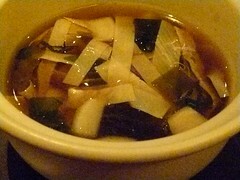 Yuba is dried bean curd skin and Coi uses the one from Hodo Soy Beanery. A light soup that provided a lovely semi-rest period before our main "entree". The tender pink meat was encased in a layer of fat, keeping all the juices in. #9: Cheese course. 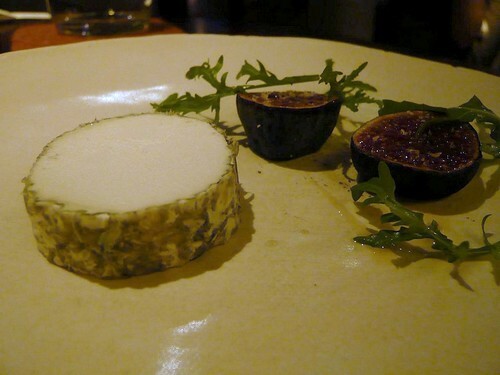 Cavatina goat cheese with mission figs, arugula. The Cavatina is a goat's milk cheese aged 3 weeks with ash rind, made by cheesemaker Soyoung Scanlan (chef Patterson seems to use this cheesemaker's products often) from Adante Dairy. I really loved this cheese. Smooth and firm, it went perfectly with the figs. While the individual components of this dessert were excellent, the overall taste was reminiscent of the amuse and the first appetizer - lightly fruity yet a bit salty. At this point I felt that this fruity/salty combination is too overwhelming for the meal as a whole. It had, in other words, became boring. This was more like it. Although the salted caramel made for yet another sweet/salty dish, it was balanced by the richness of the rest of the dish and made for a dessert more compatible to my tastes. The sweet/salty theme did get us a bit bogged down by the end, but as this did not seem to be an issue in other meals I've read about, I wondered if it was an experimental phase ... 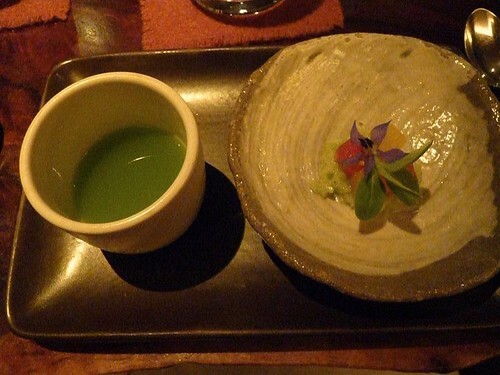 Nonetheless, the savory dishes at Coi are undeniably good and stand strong on their own. 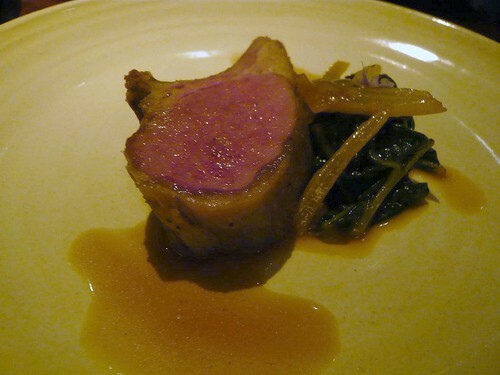 Some of these dishes remained the most memorable out of all my meals in San Francisco. Good to hear that Coi (mostly) worked out for you! Thanks for the great review. :) I'll have to keep this place in mind the next time I'm visiting SF.